(Tenero, Switzerland)- The newly-created Swiss Sailing League Women's Cup was hosted by the National Youth Spot Center Tenero and the YC Locarno this past weekend on Lago Maggiore, Switzerland. 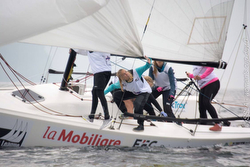 The fifteen women’s teams from across Switzerland enjoyed a total of eighteen races over the two days of racing in highly variable wind and weather conditions. While the first day was partly sunny with good winds, Sunday turned into a fiasco with little wind and lots of rain. 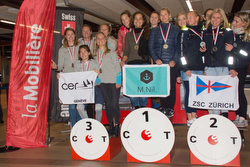 In the end, it was Team M. NIL from Zurich, skippered by Nathalie Winiger and crew of Meret Gebistorf, Irina Hotz, and Livia Naef that won with three 1sts, two 2nds and a 3rd. After 15 races with winds ranging from 4 to 10 kts, the SC Thalwil Team, skippered by Mara Bezel with crew of Giulia Corelli, Fiona Müdespacher and Alexa Bezel were leading the Women's Cup on Lake Maggiore. The racing was tight and exciting. In fact, so close that SC Thalwil was leading on a tiebreaker over Team M. Nil skippered by Nathalie Winiger. Then, just one point back was the Zurich SC Team with Armei Keller, Franziska Gluer, Olga Henneberg, Zoé Straub, and Karin Nordstrom. 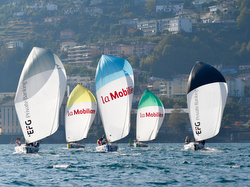 The YC Locarno PRO and RC team were lucky to get in so many races considering the weather forecasts. The initial expectation was for continuous rain and just 1-5 kts of wind from the south. However, apart from two rain showers, the sailors stayed dry and the atmosphere was excellent. From 1000 to 1600 hrs, the regatta PRO managed to run 15 races and 5 flights for each of the 15 women’s teams, so each team could sail 5 races. The racing was fast and thrilling and the lead changed constantly. In addition to the top three teams, Team CER, Société Nautique de Genève, Regattaclub Oberhofen and Thunersee Yachtclub all celebrated chances for victory in at least one race. The sailors from Club de Voile de Lausanne showed their potential with 2 race wins, but were thrown back to seventh place by a premature start. The one and only flight determined the outcome for the Women’s Cup for the day. That meant that all fifteen teams could sail just one race in the final showdown due to the terrible weather. The day dawned with continuous rain and very light winds from the north. After an initial postponement, the YC Locarno PRO sent the teams out for a “drift-a-thon” with northerly whispers of breeze of 3-6 kts max. Team M. NIL and SN Geneve each won races, as did Thunersee YC. However, SC Thalwil had a disastrous 4th place. As a result of those performances, Nathalie Winiger’s crew on Team M. NIL won the regatta with 10 pts total. However, the balance of the podium and the top five were determined by tiebreakers! At 12 pts each, Zurich SC took the silver with a 2-1-5-1-1-2 tally over Team SN Geneve (Laurane METTRAUX, Nathalie BRUGGER, Elodie-Jane METTRAUX, Marie van der KLINK, Coraline JONET) that had a 1-3-3-1-3-1 record. Then, the battle for fourth saw a tie-breaker on 13 pts each, with Team SC Thalwil (Mara BEZEL, Giulia CORBELLI, Alexa BEZEL, Fiona MÜDESPACHER) taking the 4th with a 1-2-4-1-1-4 scoreline over Team Thunersee YC (Sophie MOSEGAARD, Fiona SCHÄRFER, Maya SIEGENTHALER, Linda FAHRNI, Monika MEIER) that had a 2-2-2-2-4-1 tally for 5th place. Of the fifteen teams, it was readily apparent that the top five crews were all highly competitive and it only took one bad race to drop them out of contention for the gold. Each of those teams had a least one Olympic sailor, a World circumnavigator, World Match Race sailor, or a Swiss champion on board! For more Swiss Women’s J/70 Sailing League information Add to Flipboard Magazine.